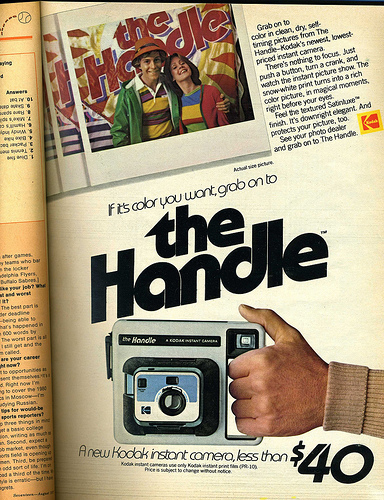 I was paging through an old Seventeen this morning and saw this ad for Kodak’s The Handle. Wouldn’t it’s namesake handle make taking one-handed pics a breeze? With the push of a thumb, instant pics. ♥ In 1985, Kodak stopped making and selling instant cameras and film because they were infringing on several of Polaroid’s instant-photography patents. ♥ When The Handle was pulled from the market, owners of the 16.5 million cameras were given the chance to send them back to Kodak in exchange for stock, a new camera, cash or $50 worth of Kodak merch. ♥ The overall cost of compensating their customers came to $150 million, including cash payments, rebate coupons and advertising costs. ♥ Other Kodak instant cameras : Champ, Colorburst, EK, Handle, Happy Times, Kodamatic, Partyflash, Party Star, Partytime, Pleaser, Trimprint. See the camera in action in this commercial, featuring SANTA. The little kids dressed up in the colors of the rainbow kill me. What old cameras do you miss? This entry was posted in photography and tagged camera, instant photography by highplainsthrifter. Bookmark the permalink.